If you are into a smart home and automatisation, you wish to make all the devices work together. And that is where the ZigBee controllers enter the scene. Like a puzzle, you can put all your smart gadgets to work connected via the controller. 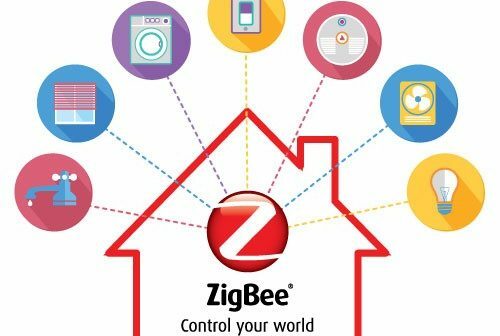 For your convenience, we have chosen five best Zigbee controllers, and you can choose which one is the most suitable for your needs. A smart way to start small with a proven controller is a Philips Hue Smart Hub (bridge). With this ZigBee-controlled hub, you can control up to 50 Philips Hue lights of your choice. This hub also enables you to control all of your Philips Hue products via the Philips Hue app, even when you’re away from home. Philips Hue system is compatible with multiple home automation systems like Nest, Samsung SmartThings, Yale, Razer, IFTTT and Logitech. You can control the lights with your voice only via Amazon Alexa, Apple HomeKit and Google Assistant. Setup of the bridge is pretty simple and straightforward. All you need to do is to download the Philips Hue app on your mobile device. The app works with iOS 8.0, but requires iOS 9.0 for HomeKit voice control through Siri to work. It also works with devices running Android 2.3 or later. Once you have downloaded the Philips Hue app and created an account, you need to connect the bridge to your Wi-Fi router with an Ethernet cable included in the package. The application will search for a hub connected to your Wi-Fi network. You will be prompted to press the button on the bridge once and enter the HomeKit number on the back. The whole process takes about five minutes. When you are done with setting up the app and the bridge, all you have to do is screw or plug bulbs in, turn them on, and search for additional lights through the app. You can connect up to 50 bulbs and 12 accessories to the bridge. The Philips Hue Hub and lights are perfectly paired with the Amazon Echo as they both work via ZigBee platform. 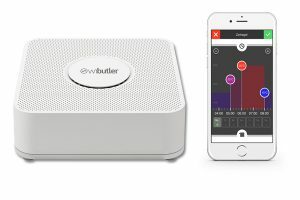 With this setup, you can control all of your lights and also activate any Philips Hue Lighting Scenes with your voice. You can control the state (on/off), the colour and the brightness (dim level) of your Philips Hue lights with Alexa. The names you assign to the lights in the Philips Hue app will also be used for voice control if you have an Amazon Echo. It is the best if you use a name that sounds natural such as “Bedroom Lamp”. This will allow you to easily identify and control it by voice. If you have groups of lights, it is possible to name them by number. For example, “Bedroom Lights 1″ and ” Bedroom Lights 2″. You can create a light group in your Amazon Echo application to control both lights at the same time with just one name (Bedroom Lights). Controlling your lights with your voice is one of the magical experiences of owning a smart home. The Amazon Echo devices are very affordable and they are a great compliment to your Philips Hue Hub. You can also connect the hub to SmartHome and enjoy other benefits such as lights turning on when motion is detected or when a door is opened, or having your lights change colours based on events that happen in your home. The Philips Hue Hub and lights are one of the core products we recommend to start your smart home, and integrated with Amazon Echo or SmartThings devices they create a very stable foundation for your smart home. The smart home centre WiButler Pro combines the best of professional and DIY world. The installation is performed by a professional, but the connection of devices is completely on you. One thing that WiButler Pro offer is the capability of offline work, by creating an access point. 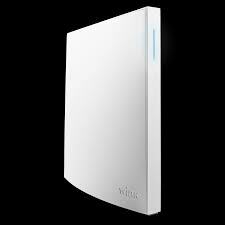 Your WiButler Pro establishes an individual network and without internet communicates with your app and smart devices. However, the remote access is no longer possible in the offline mode. The great strength of the WiButler Pro lies in the immense number of compatible components. It is excellent for heating systems, lighting solutions, window shutters and blinds and other systems. Working via Zigbee, Bluetooth, Bluetooth Low Energy, Z-Wave and EnOcean, it allows you to combine different devices that work on different radio signals. Wibutler Pro offers three reasonably priced starter kits for a quick start, as the server alone cannot do much. Each starter kit contains a set of radio-controlled sockets, radio buttons or other elements. The installation is carried out by the specialist. You can add products yourself later. The professional will connect various components with the controller and later you can use IFTTT rules to connect the devices among each other. For example, the heating automatically shuts down when the window is opened. The specialist can also create a floor plan of the apartment in the application and place the individual network components in the appropriate places in the room. With this overview, you can later quickly find and control the device of your choice. Installation by the professional is a good move concerning warranty and creating rules and it also protects you from misaligning something in the system. After the specialist has left, it is up to you to self-train the products via the application. The operation of the WiButlers is overall very simple and intuitive. The menus of the app are meaningful and chic. During the learning process of the components, the apps will lead you through the individual steps. Even creating rules raises no questions. Only the products that do not have a “Professional” label on the WiButler website can be self-trained. These products include the door-window contacts, socket adapters, wall switches, radiator controls, remote controls and networked lamps from Osram and Philips. For the self-taught components, you can set rules and determine the behaviour of the profiles such as “home-day”, “on the way” and others. The different scenes can be activated via remote control, switch or smartphone. 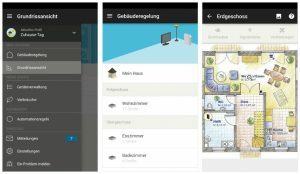 The individual devices of your smart home are presented in the app in the “building regulation” sorted by the floor and space. In the “floor plan view,” you can find the products in the appropriate place in the room. In the device manager, the app shows the individual products with their variables. Equipment marked with a lock is available only by the installer. The application is straightforward and it leads you through every step of adding the new devices to the network. The WiButler Pro is compatible with Zigbee, Bluetooth, Bluetooth Low Energy, Z-Wave and EnOcean. It is compatible with Amazon Echo and works well with Alexa. If you want to connect all areas of your home, then WiButler Pro is the best choice for you. It is far cheaper than most professional installations. However, the possibilities are somewhat limited, as currently no surveillance cameras, music systems, televisions or household appliances can be directly integrated. 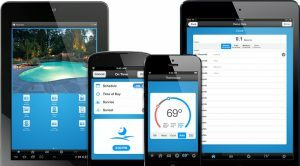 For this, the WiButler Pro encompasses all areas of a typical home automation system with light, shading, security, climate and energy. And even if you are not a DIY person, professional can set it all up for you! If you are about to start building a smart home, Insteon Central Controller Hub will help you get off to a very good start. It’s easy to set up, very affordable, and its dual-band technology helps different smart gadgets talk to each other without interruption. This means that wireless technology uses both wireless radio as well as existing power lines to deliver reliable and fast communication. Installing the Insteon Hub is very easy. All you need to do is to connect the device to your Wi-Fi router, download the Insteon app and follow its setup instructions. 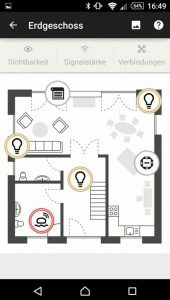 Insteon can be remotely controlled via tablets, smartphones, laptops, and computers and you can access the Insteon app from the iTunes App Store, Google Play and Amazon Echo. Once you have your Insteon Hub connected, you can add devices. As the hub is dual band it can connect the devices that use different protocols. As it is compatible with Amazon Echo, you can control the devices using Alexa voice commands and its skills. Insteon acts like a mesh network and offers an unlimited network size for smart homeowners. It uses Zigbee, Z-Wave, Bluetooth and Wi-Fi, and can be connected to thousands of devices to one hub. The hub is compatible with Apple HomeKit, Amazon Echo, Logitech Harmony Remotes, Stringify and Sonos. Additional nice feature Insteon offers is compatibility with iOS, Android and Windows devices. In addition, Insteon Hub is compatible with more than 200 products under the Insteon brand. This includes switches, keypads, plug-in switches and bulbs, outlets, sensors, remotes, thermostats, low voltage I/O control, Wi-Fi cameras, different embedded devices, extenders and bridges, computer interfaces and accessories. It also works with Nest products. And the best thing is now you can connect your home with Tesla (if you own one) and make sure you take your home wherever you go! If you are in for smart home and are a fan of Insteon products, Insteon Central Controller Hub is a perfect solution for you. And, while its eco-system is robust, it is really nice how their products are compatible with other market leaders like Amazon Echo, Apple HomeKit and Nest thermostats. This offers you various choices for building the best custom solution for your smart home. The Wink Hub 2 is the second iteration of the smart hub of the same name. Released in the fourth quarter of 2016, the device offers impressive features and is a huge improvement over its predecessor. The Wink Hub 2 comes at an affordable price and is packed with both wired Ethernet and dual-band Wi-Fi support. The elegant, sleek and stylish new design is enough to catch the eye. A thin LED strip on the top front edge informs you what’s going on: it blinks blue while pairing, white while rebooting, and solid blue when everything is connected and working as prescribed. Yet, the biggest strength of the device is in its user-friendly app and the ease of installation. 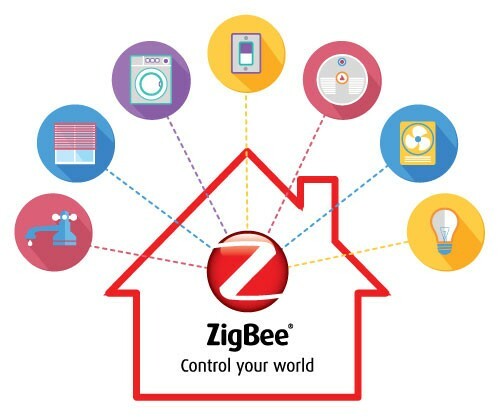 Another huge selling point of the hub is its support of all major protocols, including Zigbee and Z-Wave. 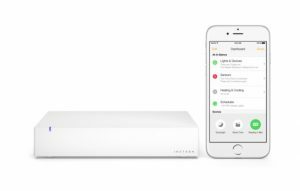 The Wink Hub 2 also supports a few more obscure protocols, such as Kiddie, Lutron and Clear Connect. Another great feature of the device is its Amazon Alexa and IFTTT support. However, the possible lack of Wink Hub 2 is missing the battery backup. Setting the Wink Hub 2 up and running it is pretty straightforward. Even though Wink suggests using a wired connection for simplicity, you can install the hub wirelessly. Next step is to download the app to your iPhone or Android device, and then follow the setup instructions in the application. Once you finish the configuration of the hub, you can relocate the hub anywhere in your house and connect it to your router’s 2.4GHz or 5GHz band. The Wink App doesn’t have a home screen like you might be used to see. Instead, the main screen displays whatever category of device you selected from the side menu. The thing you, unfortunately, cannot do is to group devices from different categories together by room. You can then set schedules or Robots which are actions that occur based on predetermined conditions. For example, you can set up Robot which will turn on lights and send a notification when the security camera detects movement. However, if you’ve created a schedule on a particular device’s app, those settings won’t transfer over to the Wink app. You’ll have to set them up all over again. 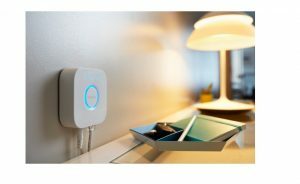 The Wink Hub 2 supports ZigBee, Z-Wave, Lutron Clear Connect, Kidde, Wi-Fi and Google’s Thread. Additionally, it works with Amazon Alexa and IFTTT, and you can control it using Android, Android Wear and iOS devices. You can control whole smart home, from thermostats to garage door openers and water-leak sensors with this hub. 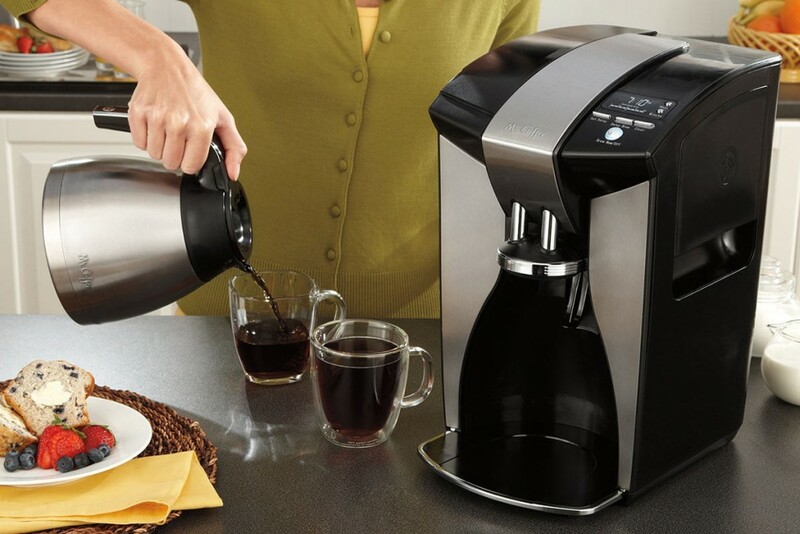 The list contains 66 products by different manufacturers: Philips, Arlo, Bali, Sylvania, GE, Cree, Commercial Electric, Carrier, Ecobee, Google, Kidde, Honeywell, Ring, Yale, Halo, Schlage, Sonos, and numerous others. You can check the complete list on Wink’s website. Even though the hub is not compatible with Google home, it works well with other Google’s products. 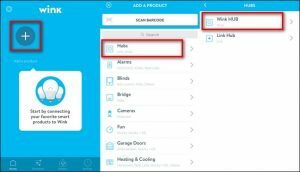 With straightforward installation and all devices gathered in one application, Wink Hub 2 can be one of the best solutions for newbies in home automation as well as for experts. With its sleek design, it can fit all surroundings, while the hub is very responsive and the app is thoughtfully designed and easy to use. 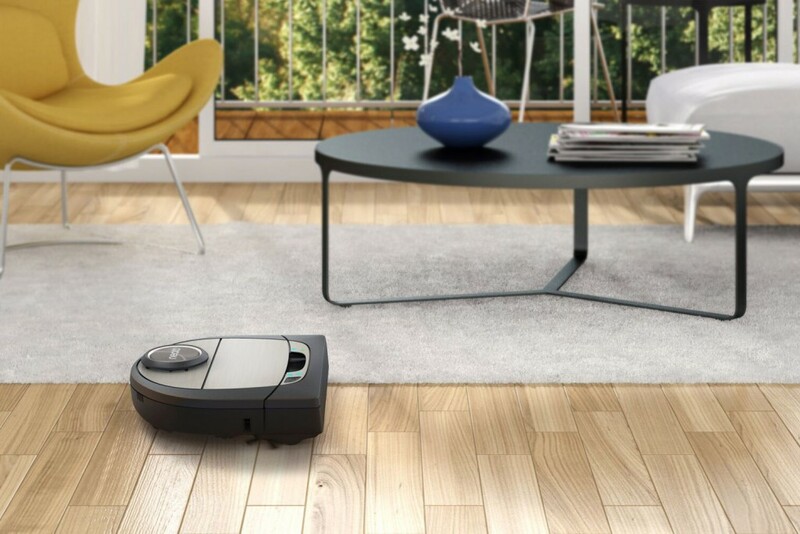 With Robots and scheduling, you can make the perfect atmosphere for every moment in your smart home! When it comes to connected home, the best thing is when you centralize it. And one of the easiest ways to do it is to use the hub. Samsung SmartThings Hub 3rd Generation makes it all a piece of cake and enables your home to work as a smart being. 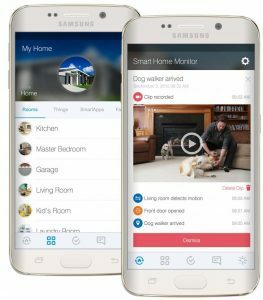 It took several years of hard work for Samsung to make the third edition of SmartThings Hub which is advanced in many ways, compared to the previous two versions. First, there is the appearance, which makes this hub more discreet and more adaptable to any home interior. It is smaller than its predecessor or competitors and with a rounded shape. The Hub has three ports on the back: one for a USB port, one for the power adapter, and one for a wired Ethernet connection, if you choose to place it next to a router. As routers are often on the periphery of a home, it’s a good thing the Hub also has built-in 802.11AC wireless networking, because it allows you to place any wireless device, and especially a Smart Home hub, in the centre of a home. 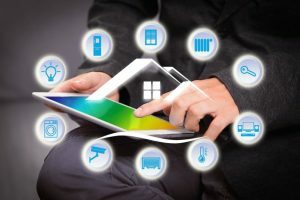 It includes both Zigbee and Z-Wave radios and Wi-Fi connection, which allows connections to most of the Smart Home products on the market. While setting up the SmartThings Hub 3rd Generation, there are a few ways to judge it. First, we can analyse the ease of setup and device installation. Second, we can look at its support of third-party devices. And third, we can look at the performance of the SmartThings app, which is what you use on a daily basis. To set up the different SmartThings accessories, you will have to scan a QR code on the device (or included in the box) using the SmartThings application, and the product is automatically added to your Smart Home system. For third-party device installation, you won’t have a QR code, still, the process is still relatively simple, as you can find the product in the list in the application, or add it manually. The responsiveness of the app is excellent, it is quick and the on/off buttons in the app work instantaneously. SmartThings Hub 3rd Generation and Amazon Echo work together brilliantly as voice commands issued to Alexa are done on in a split-second. 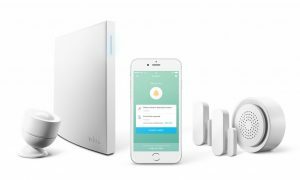 You can control a really wide range of devices via SmartThings Hub 3rd Generation, such as Ring video doorbells, Philips Hue and Sengled smart lights, Ecobee thermostats, Lutron Caseta switches and plugs, Yale, Kwikset and Schlage smart locks; and Netgear Arlo cameras. Amazon Echo with Alexa AI and Google Assistant can be used for voice control of devices connected to SmartThings. You might find it as a disadvantage, but there’s no integration with Nest, August or TP-Link’s Kasa which are among the bigger names in smart home products. SmartThings Hub 3rd Generation enables you to can link devices together in a single app, like, for example, to warn you if a window is open and a rainstorm is approaching or to turn off your thermostat if a window is opened. With SmartThings’ sophisticated automation possibilities, connecting your smart home devices are almost endless! As a doctor of dentistry, a specialist in marketing management and master of economy and management, I like exploring new fields in science and lifestyle. The smart home is my field of interest together with home improvement and upgrade of living space. I'd love to give a contribution to all people to make their lives modern and comfortable by enlighting them with new pieces of knowledge about smart homes and tech advancements.